The passenger in-flight sky map shows Stansted airport in Kent. British Airways has been using maps placing the UK's third largest airport 40 miles out of position. Passenger in-flight skymaps show Stansted Airport in Essex to the far side of the Thames Estuary, in the rural parish of Stansted, Kent. The error, which affects the airline's entire 67-strong Airbus fleet, has not been replicated on pilots' navigation systems. New software must be installed to put the airport in the correct position. But BA said it first needed to find out whether those hired to produce the maps intended the village to be highlighted instead. It doesn't surprise me that this has happened because we are always getting confused with Stansted in Essex. A BA spokesman said today: "We will have to look into it but if there is any implication that they intended the village of Stansted to mean Stansted airport then we will change that. "What we need to find out is whether whoever was responsible for the maps intended for a little village with a population of 200 to be highlighted as the airport. Probably not. "It would seem odd that a little village has been highlighted. 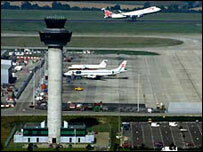 It's a reasonable assumption to make that they thought it was Stansted Airport but clearly we will have to check this." It appeared the cartographer responsible for the in-flight skymaps, which enable passengers to check their location, inadvertently confused the Essex airport with the tiny Kent village in the Tonbridge and Malling district. But confusion between the Kent village and Stansted Airport is nothing new, according to villagers. Anne Roberts, landlady of the Black Horse Inn, said: "It doesn't surprise me that this has happened because we are always getting confused with Stansted in Essex. "We sometimes get big articulated lorries with cargo for Stansted Airport driving around the village. One time I found a woman who had driven all the way from Southend across the Dartford Crossing because she thought this was where the airport was. "I've even found my bed and breakfast business advertised on some websites as an airport hotel, yet we are located miles away from Stansted in a totally different county."